GG8RA X1 HOLTS REPAIR BANDAGE. item 1 Holts Gun Gum Exhaust / Silencer Repair Bandage GG8R HOLTS REPAIR BANDAGE! 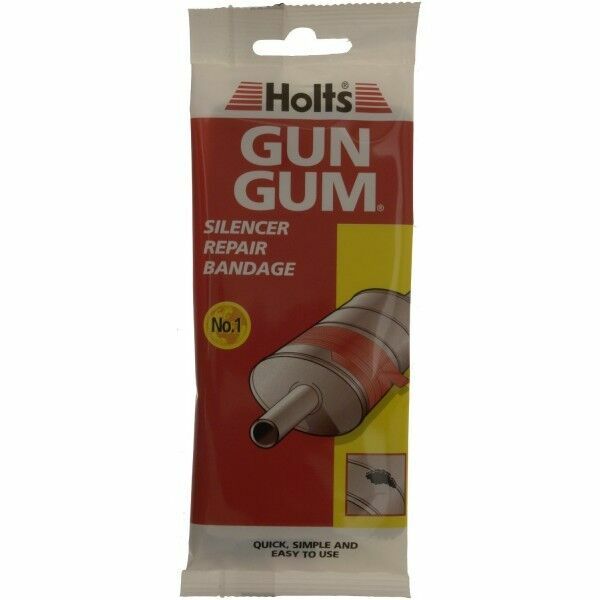 -Holts Gun Gum Exhaust / Silencer Repair Bandage GG8R HOLTS REPAIR BANDAGE! item 2 Holts Gun Gum Exhaust / Silencer Repair Bandage GG8R HOLTS REPAIR BANDAGE! -Holts Gun Gum Exhaust / Silencer Repair Bandage GG8R HOLTS REPAIR BANDAGE! The last time I used this product was over 30 years ago and it worked fine then which is why I have bought it now as I have some holes in the tailpipe of my old Suzuki Jimny. In view of rubbish weather, however I have postponed repair to avoid pneumonia. I will report back after I have used it to report on any changes to product quality. I'm always ready to admit that circumstances vary but having bought a product from a recognized name that I have grown up with I expected it to work on my tractor mower exhaust. In reality it simply 'burnt up' and fell apart within minutes. great product,anyone using this dampen then apply and then cover in heat tape foil backed. good for a quick, cheap exhaust hole repair. Kit contains a bandage,foil and wire. After having gun gum repair paste fall out twice i tried this and it did the trick, you wet and wrap it around the hole(s) or in my case long rusty gashes and secure it with wire until it hardens and stops the leaking fumes and noise. Put something clean under the exhaust section you are wrapping otherwise the bandage will drag on the ground as you wrap it around and pick up dirt. Kit contained enough to fix two bad holes with some left over.